We run a wide variety of boat trips from Largs on the fantastic Firth of Clyde. 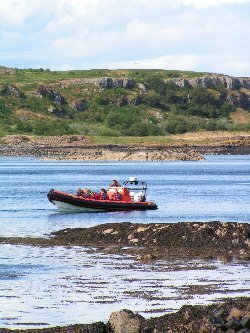 At CUMBRAE VOYAGES we have trips to suit all ages, abilities and budgets. During high season we operate mostly from Largs Promenade and during other periods we also run from Largs Yacht Haven (marina). Please check on booking as to your start location for your trip. 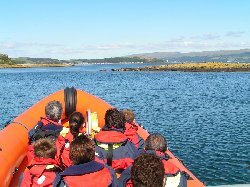 If you are interested in Wildlife watching trip to see Seals, Basking Sharks, Dolphins & a wide variety of marine birds then select 'Wildlife & Adventure' from the menu above. If you wish to spend a day or half day at a particular venue and get their on board our custom built boats then this under our 'Day Trips' section. We also cater for large groups, schools & other educational organisations. Discounts are available for these groups. We can also cater for those with disabilities and a very wide range of ages. If its an exciting day or weekend you want for your STAG / HEN DAY then we will make a day to remember. Although we are based in Largs, Ayrshire on the West Coast of Scotland, we can also transport the boats by road to your location. Further up the Clyde we can also run from Braehead and the SECC taking you from/to GLASGOW CITY CENTRE. So you could start your Stag or Hen day in Glasgow City Centre and end up in another location such as Tarbert or back to Largs at the end of your day. With our events we organise the entire day for you including everything you require such as road transport, catering, accomodation, drinks, photographer and anything else you may wish! !